Bosques de Palermo, Buenos Aires, Argentina. The Paris of South America by Christine Edbrooke is an architectural tour of 19th century Parisian-style architecture in Buenos Aires. Your guide is an economist who is currently researching the economic development of Argentina at the beginning of the 20th century. A Literary Walk by Alejandro Frango reveals Buenos Aires through the writings of famed "porteño" writers. Arts & Crafts by Georgina Kiernan visits galleries, art exhibitions, street fairs and artists' studios. Your guide holds a degree in Latin American Contemporary Arts. Pirates, Patriots & Immigrants documents the history of migratory groups into Buenos Aires since 1580 through archaeological discoveries, and is conducted by archaeologist Marcelo Weissel, who is working on some of the excavations. Evita's Buenos Aires visits the recently-opened Museo Evita and other sites associated with this beloved personality, offering an insight into her life from its humble origins to the acme of power. Jewish Heritage Tour is a chance to get acquainted with the traces and traditions of the third largest Jewish community in the world, one that has contributed to the culture of Buenos Aires from its very beginning. The Museum Mile is composed of museums with world-class collections of Latin American, Argentinean and European art. These include the National Fine Arts Museum, with work from the Old Masters to the modern ones, such as Picasso and Pollack. The Latin American Museum of Buenos Aires displays the unique South American take on Impressionism, Post impressionism, Fauvism, Cubism, Futurism, Expressionism and Surrealism. Other museums feature decorative arts. The tour can be tailored to your interests. La Boca District / Ezeiza Residence (in San Telmo)/ The Government House (Casa Rosada) / The National Congress Palace / Colon Theater. The World of an Artist is chance to become personally acquainted with the artists of Buenos Aires and their world. Wine Tasting by Alejandro Frango. With your guide -- a true connoisseur -- you will sample a selection of the best Malbecs of Argentina, perhaps the best in the world. The Jesuits brought the vines to America, and from the Estancia of Jesus Maria in the Province of Cordoba, Argentina, in 1638, they exported the first wine from the New World to Europe. A Cooking Workshop by Alejandro Frango is an easy and friendly way to learn about Argentinean-style cooking. We provide the raw materials, an apron and an oven. We cook together, then later eat, drink and chat about the philosophy of cooking. Not recommended for vegetarians. 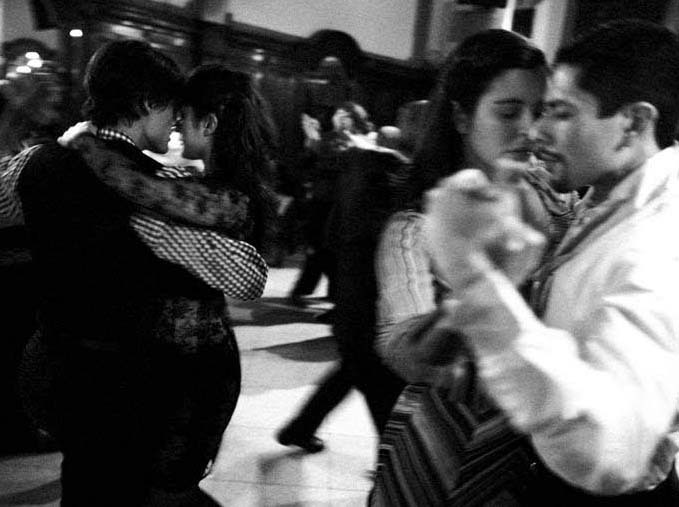 Dancing in a milonga (neighborhood tango club), Buenos Aires, Argentina. "We are what we eat", philosophers´say. Alejandro Frango, our famous gastrosopher, unveils the city of Buenos Aires and introduces Argentina by organizing a full day enjoying the best food. 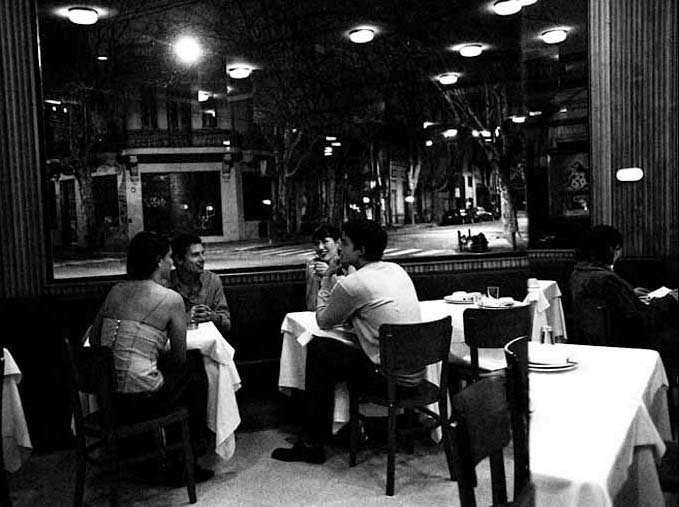 We start with the porteño experience at three cafes to follow with a unique lunch in selected restaurants while getting acquainted with the city. Short break for a nap. And end with a gourmand dinner at one of the best restaurants in the city. "We, the people of Buenos Aires, well-known all over the world for the quality of our beef and for Tango are upset because after the success of "Evita" everybody is crying for us. We want to show our visitors that Argentina, the world's first producer of lemons, of garlic and of apples, the world's second producer of pears, the fifth of wine and the tenth of cheese, has something to offer you more than beef, tango and blond politicians. We, the epicureans of B.A. have developed a Gourmand Day. We begin by having breakfast in three outstanding cafes of Buenos Aires. Puerto Madero and the vision of the old docks is our first target and breakfast at "I Fresh Market". 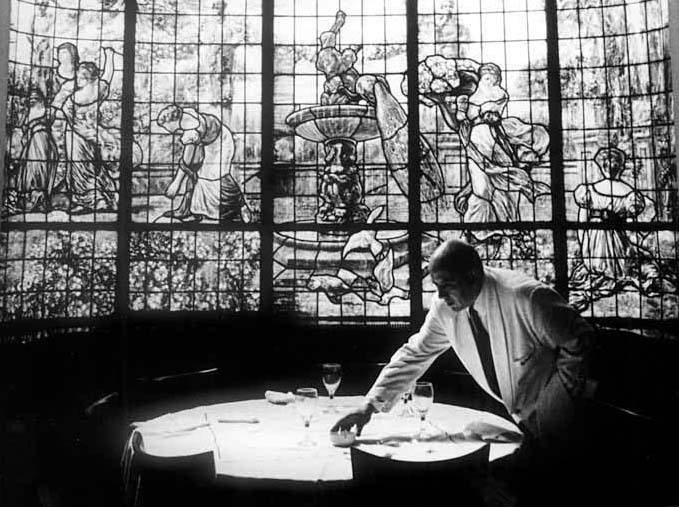 Tortoni, the oldest cafe in the country opened in 1858, center of poetic and political life in down town, will be the second stop. We wll be finishing at Cafe Las Violetas in Rivadavia and Medrano. After some strolling and conversation we, feeling hungry, should be thinking of something to eat and will be enjoying some beef or game or fish or pasta, or if necessary all of them together in one of the many gourmand restaurants that Buenos Aires offers. Time for some rest, perhaps a nap or some shopping, or a few hours at a spa and when the moon has taken the place of sun, we are ready for dinner and again a superb place has been chosen to enjoy this Gourmandise expèrience. Our guide will lead a visit to this charming old city, declared a World Heritage Site by UNESCO. Colonia is a charming little city 45 km by canal across the Rio de la Plata from Buenos Aires. Due to its location -- so close to Buenos Aires -- and to the entrance of the Parana and Uruguay Rivers, it was an important strategic and political enclave, fully appreciated by the Spanish and Portuguese. The city of Colonia is commonly known for its Old Town -- with buildings and constructions that date from the Portuguese domain. Stone houses and cobblestone streets are part of the character of the city. Home of the gaucho (local cowboy and true symbol of the independent, lonely, free spirit of the mestizo population) the Pampas are seemingly endless grasslands, dotted with lakes, ponds and wetlands. The surprisingly abundant variety of wildlife is especially rich in its birdlife diversity. A visit to the Pampas is enhanced by the presence of the legendary estancias, which bring insight into the early history, development, and present traditions of the country and give a chance to rub shoulders with gauchos and with the families, which own the estancias. Due to its proximity to Buenos Aires, enjoy a taste of the Pampas, visiting an authentic estancia where you will be able to learn about their origin and history, to appreciate gaucho dexterity in cattle and horse management and try some of the exquisite regional foods, especially empanadas (turnovers) and delicious asados (barbecues where even the most unthinkable parts of the cow can be grilled) while enjoying the local music and dance. Full day dedicated to visiting an authentic "estancia". Ideal setting to appreciate gaucho dexterity in cattle and horse management and try some of the exquisite regional food, specially the delicious "asado". Lots of possibilities to saddle up your own Argentine horse for a ride. Riding is a skill acquired early in life for most Argentines. This magical, historic estancia is ideal for your perfect horseback riding vacation. Dating back to the seventeenth century, Dos Talas has maintained its legendary reputation of being one of the most important estancias in Argentina. It features a 98-acre park that surrounds the main residence and a French chapel, which contains antique French art. It also has an extensive collection of books from the sixteenth and seventeenth centuries. It is located in Dolores, 127 miles south of Buenos Aires, and offers 4 rooms in a French-style mansion: 1 suite and 3 rooms with shared bathrooms. From your room you can gaze out to the beautiful gardens and cattle grazing in the seemingly endless expanse of the pampas. What makes this estancia so remarkable are the many broad avenues of huge trees that line the different corners of the grounds. 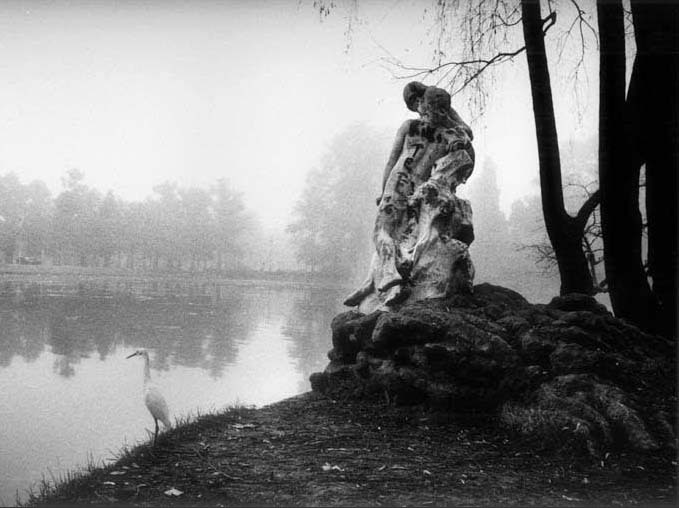 The garden was designed in 1908 by Charles Thays, the French landscape architect. It all started with the famous Basque-French pioneer Pedro Luro who came to Argentina at the tender age of seventeen without a penny to his name. Through hard work, determination and amiable character, he became one of the most important land owners in the region. The estancia is still in the hands of the Luro family, which is the fifth generation to continue the tradition. You have a range of activities available, including horseback riding, cycling, guided rides, and swimming, as well as a chance to try Argentinean-style barbeque and other local specialities. The best way to explore the pampas is by horseback, where you can spot hares, rheas, armadillos, foxes and cattle of the ranch. Another highlight is taking a ride to the lagoon at sunset. There is also the option to ride alongside the guachos as they round up cattle and perform other daily activities.